October 31st of each year officially kicks off the holiday season for Eucalyptus Avenue in San Carlos. It is “party-central” for Halloween in The City of Good Living. 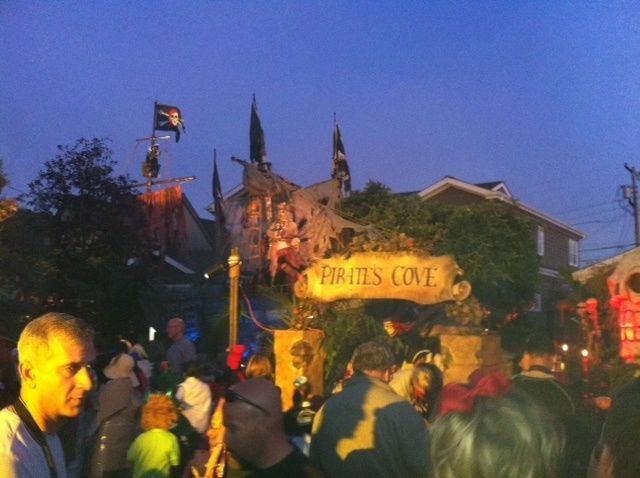 Outrageously creative Halloween displays, kids trick-or-treating, adults sampling their favorite beverages in red cups and a prevailing feeling of controlled-chaos fills the air. Year after year, Eucalyptus Avenue seems to one-up itself in terms of the displays and their generosity. The amount of people traveling to this now famous, San Carlos street seems to increase year after year. Themed displays such as the Pirates of the Caribbean, Alice in Wonderland and a 70’s Dance Party have all made their mark on Eucalyptus. I do not have any idea what they have planned for this year, but they are yet to disappoint. One point that seems to get slightly overlooked each year with the residents on Eucalyptus is the fact that each resident gives so much back to the city. Whether it be the effort and expense that goes into turning their homes into mini-haunted houses or placing enough lights on their homes so that they can be seen from outer space, the folks on Eucalyptus do it for everyone’s enjoyment. Perhaps it’s the 2,000 pieces of candy given out by each house on Halloween or the fact that they give up the ability to back out of their own driveways for one month a year during the Christmas season so that others can enjoy their street….it all ends at the same place….a very generous group of people. Eucalyptus is, in a nutshell, the essence of a small town community feel that has worked so well for San Carlos. Eucalyptus represents the very best for our city. On behalf of all San Carlans, a giant THANK YOU to all of you.